In 2015, we undertook our fifth European tour. For the first time, a group of Friends accompanied us for part of the tour. We very much enjoyed getting to know our Friends during the first 15 days of our tour. The 2015 Friends Tour itinerary is below. June 26: Meet your guide and driver at Frankfurt airport* and head for Nördlingen (2 h 30 min), pictured left, where you check into your hotel NH Nördlingen (pictured right). This is a 4-star hotel in a converted monastery, right in the centre of the old town, where you stay for 3 nights. Nördlingen is one of two towns in Germany that are completely surrounded by a wall (The other is Rothenburg ob der Tauber, pictured left below). Enjoy a walk around the fascinating town centre of Nördlingen, with its many historic buildings. Take your time and read about historic buildings in the brochure provided in English by the Tourist Information office next door to the church. A walk on the wall is recommended. June 27: 9.45 Meet Douglas in the historic Georgskirche, a church dating from 1451, which is right at the centre of this walled Medieval town. Douglas will introduce and demonstrate the immaculately copied 1610 Baroque “swallow’s nest” organ, rebuilt in its original position after it was destroyed by fire in 1974. The demonstration will finish at 10.30. 12.00 Orgelmusik zur Marktzeit (Organ Music on Market Day) Klaus Ortler, Director of Music at St Salvator, Nördlingen will play a concert on the Peter-Rensch Organ in the Georgskirche. (Details coming soon). A climb to the top of the church tower is well worthwhile: Nördlingen’s tower is one of only three in Europe that are constantly occupied by a watchman, the others being Münster and Krakow. And from the top, you can see how the town is situated at the center of a crater created by a meteorite. In the afternoon, visit nearby Harburg castle. As we want to keep things flexible for you, all our sight-seeing activities are optional. You should therefore expect to pay a small entry fee except where indicated. The choir’s first concert for the tour takes place in Georgskirche at 7.30pm. June 28: 9.30 to 10.30 The ACC will sing at a service in Georgskirche. Following the service, visit the Spitalkirche (Hospital Church) at 30 Baldinger Strasse on the way to the Baldinger Gate: This 14th century building was once part of a monastery and hospital and is not normally open to the public. The altar tryptich in this church was painted in 1587 by Jerome Wehinger (1550-1613) who lived in Nördlingen from 1572. 10.45 to 12.00 For those who are interested, Douglas will run a “Friend’s Choir” rehearsal in the Spitalkirche. This is absolutely optional! 12.15 You are invited to join the choir for a grill party (German for barbecue) in the church hall and garden, hosted by Georgskirche’s Director of Music, Udo Knauer. In the afternoon, those who are interested can join an excursion to Rothenburg ob der Tauber (photo left courtesy of Wikipedia), another medieval jewel on the Romantic Road with over 1,000 years of living history. As you walk on the massive walls, you will see 40 or so gate and defense towers. Stroll through the cobbled streets, which are lined with half-timbered houses. Rothenburg has four museums, of which the most popular is the Medieval Criminal Museum. If you choose to go inside, you will find prisons, dungeons and instruments of torture. The most famous of the town’s churches is St Jacob’s, renowned for the Holy Blood Altarpiece, carved by Tilman Riemenschneider in 1505. During the 30 Years War, the Roman Catholic General Tilly laid siege to this protestant city, capturing it in 1631. The town was saved from plunder and pillage by the Master Draught. We will tell you the story. Return to accommodation in Nördlingen. June 29: Travel to Tübingen (2 h 30 min). Visit the old town. Take a Stocherkahnfahrt (like a gondola or punt for max 16 people, pictured right) on the Neckar River. Walk around the Castle (Schloss Hohentübingen), which dates from 1078 and is now a part of the University. In this castle is the laboratory where Friedrich Miescher discovered DNA in 1869. (Free entry to the gardens). Have lunch in one of Tübingen’s historic restaurants overlooking the Neckar River. 7.00pm The Choir performs at Pauluskirche, a modern church near the Max Planck Institute. After the choir’s concert, you are invited to join the singers for supper at the home of Prof Andrei Lupas, Director of Protein Evolution at the Max Planck Institute, Tübingen and his wife, Janice Lupas. July 1: Travel to Bonn. Depart Tübingen at 9.00am. Today’s journey takes us along the Rhine River, with its vineyards, castles and picturesque villages. About 12.30pm, we arrive in one of the most beautiful villages, Rüdesheim, stopping here to give you a chance to have lunch and look around. 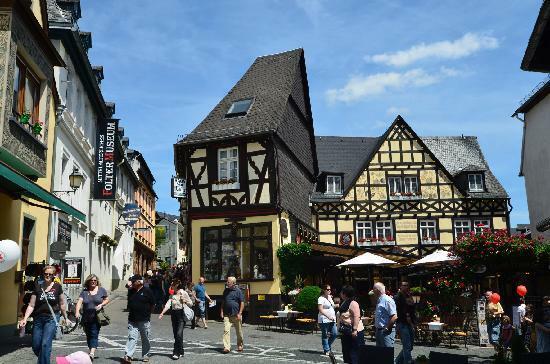 The photo (right) of Rüdesheim is courtesy of TripAdvisor. Continue to Bonn, departing Rüdesheim at 2.30pm. As there are no bridges on this 90k stretch of river, we cross the Rhine on one of the famous passenger/car ferries. The crossing to Bingen takes only a few minutes, but gives you the chance to experience one of the busiest waterways in Europe. Arriving in Bonn two hours later, check in to the Hotel Collegium Leonium 4****. Visit the house where Beethoven was born, now a museum. July 2: Full day sightseeing in and around Bonn. 8.00pm The ACC has a concert at the Kirche Sankt Marien, Adolfstraße 28, Bonn. July 3: Travel to Berlin (3 h 50 min). Check in at Leonardo Royal Alexanderplatz Hotel 4***. More detail coming soon. July 4: Full day sightseeing in Berlin. 6.00pm The ACC sings a concert in the Kaiser Wilhelm Memorial Church, Berlin’s most famous landmark. The concert is part of the Chorvesper in der Kaiser-Wilhelm-Gedächtnis-kirche series. July 5: Travel to Copenhagen: by coach to Rostock (2 h 45 min) and then on the Rostock to Warnemünde Ferry (2 hours), leaving the ferry by coach and travelling onward to Copenhagen (2 hours). Check in to Skt Petri Hotel 4*** (picture below courtesy of Skt Petri Hotel). From the hotel, you can see the historic Trinitatis Church, where the choir will perform. Connected to the church is Copenhagen’s famous landmark, the Round Tower, erected in the 17th Century by King Christian IV. For a small fee you can go into the tower and ascend its spiral corridor. At the top you can visit Christian IV’s astronomical observatory and enjoy an excellent view over Copenhagen. You can also visit the Trinitatis Library hall, located in the roof of the Trinitatis Church and accessible via the Round Tower. We provide you with tickets to the Tivoli Gardens, Copenhagen’s historic amusement park in the centre of the city with its old fashioned arcades and picturesque surroundings. July 6: Sight-seeing in Copenhagen: Pass by the Tivoli Gardens and the Ny Carlsberg Glyptotek. Drive through the colourful canal district and listen to recorded commentary about the major sites, from the National Museum to Christiansborg Palace, home to the Danish Parliament. Continue to the Old Stock Exchange and across Kongens Nytorv, where the Royal Theater (home of the Royal Ballet) is situated. Drive through the vibrant harbour district of Nyhavn to Amalienborg Palace, winter residence of the Danish Royal Family. Here you will have the opportunity to see the Changing of the Guard. Next you will visit the Gefion Fountain and the Little Mermaid, a statue inspired by Hans Christian Andersen’s fairy tale. Last but not least, we pass Rosenborg Castle, where the crown jewels are protected by the Royal Guard. 4.30 pm ACC Concert: Trinitatis Church. July 7: Travel to Ystad (1 h) on the Oresund Motorway, which, since July 2000, links Denmark and Sweden via an 8-kilometre bridge (Known to many from the Swedish TV series, The Bridge). The picturesque 11th century port of Ystad (population 18,000) has been popularised by the Swedish TV series, Wallander. Wander the historic streets and dine in one of Ystad’s cosy restaurants. After lunch, take the ferry to Denmark’s holiday island of Bornholm (1 h 20 min). Check in at Hotel Griffen 4*** (photo right courtesy of bornholm.info). The hotel is 400 meters from Nørrekos beach on the Baltic Sea and a 10 minute walk from Rønne’s historic centre, with its cobblestone streets and half-timbered houses. Enjoy a Danish beach experience or explore the old town of Rønne. 8.00pm ACC concert in the St Nicolai Church on the harbour. July 8: Return to Copenhagen by ferry and coach and check in to the Skt Petri Hotel for one more night. Spend the day in Copenhagen or travel with the choir to Sorø (47 min). 8.00pm The ACC performs in the Klosterkirk (Abbey Church) for the Sorø International Music Festival. Before the concert, explore the Abbey, founded by Danish Archbishop Absalon and built from 1161 to 1201. The church is constructed from red brick, which was a new material for the time. Walk in the extensive surrounding College Gardens and visit the royal graves in the crypt. After the concert, enjoy a Danish beer and a snack with the choir before returning to accommodation in Copenhagen. July 9: Travel to Hamburg, by coach from Copenhagen to Rødby (1 hr 47 min), the coach boards the ferry for the crossing to Puttgarden (1 h 20 min). You can buy lunch in one of the restaurants on the ship, shop for duty free goods or just watch the view. We travel onwards by coach to Hamburg (1 h 40 m). Check in at Hotel 25Hours 4*** Hafen City, Hamburg. PM concert and dinner with the choir. July 10: Hamburg. Full day sightseeing. Climb the tower of the beloved St. Michaelis Church and admire Hamburg from above. Wonder at the imposing City Hall, and give in to your shopping urges in the magnificent Jungfernstieg shopping street. Stroll around the Outer Alster Lake with its beautiful views, and find out how much green space the Hanseatic city has to offer. Pause the tour at the St. Pauli Piers, and visit the exciting historical warehouse district. Finish your day with a boat ride around the harbour (tickets provided). A visit to Hamburg without a tour through the harbour is almost unthinkable. No other city in Europe has more bridges than Hamburg, not even Venice. Approximately 2,400 structures cross over the waterways, canals, and harbour basin. From the boat, explore the various city attractions (depending on the tide and the time of day). Admire the historical Speicherstadt (warehouse district) with its narrow waterways, the modern HafenCity, the numerous bridges over the Elbe River, busy locks and container terminals, the large Blohm and Voss shipyard, the Köhlbrand Bridge, and much more. Along the way, learn interesting facts about the city and its history as well as the incoming and outgoing ships. Simply sit back and enjoy the fantastic views from the water. July 11: End of services. Our driver will take the group to the airport*, or continue with your own onward travel. The singers of the ACC continue to the Festival Mitte Europa and more concerts in Germany and Switzerland. Click here to read the full 17-concert schedule. • a “Friends Choir” for those who are interested. Not compulsory. Just for fun! • Tour Manager: Cathy Sullivan, Managing Director of Eastern Hill Travel will accompany the Friends Tour. The above package is managed by Eastern Hill Travel in partnership with PEGA DMC, Germany. * Eastern Hill travel is happy to arrange competitively-priced return airfares with a reputable airline. Coach travel to and from the airport will be available for those who travel with the group.